Novel composite glazing panels provide an opportunity to significantly reduce the weight and depth of glazed facades and simultaneously minimize the visual and spatial bulkiness of conventional facade framing systems. However the mechanical response of these novel composite glazing panels is poorly understood and there is no published data on the flexural response of large scale panels. In this research, medium scale (700-mm long and 300-mm wide) and large scale (3500-mm long and 1500-mm wide) composite glazing panels were fabricated and tested in bending up to failure. Recently developed analytical model for composite sandwich panels was also implemented on the medium and large scale panels. The experimental test data shows that shear-lag effects can be significant in large scale panels and can reduce their effective widths by about 40%. The analytical model provided a good fit of experimental results when the effective width was reduced according to strain gauge measurements. Neglecting shear-lag effect is unsafe and would underestimate deflections and stresses by approximately 40%. 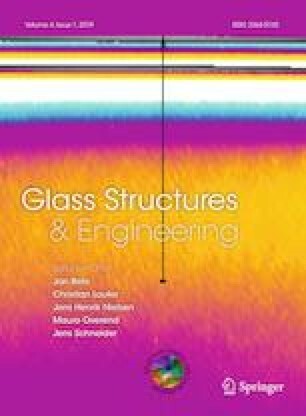 Further research is required to quantify the shear-lag effects, and the corresponding variation of effective widths, along the length of composite glazing panels and the influence of load distribution and boundary conditions on the effective thickness of the glass panels. The authors would like to thank the Engineering and Physical Sciences Research Council (United Kingdom) for the financial support of the project with two Grants EP/MO 17699/1 and EPSRC IAA Follow-on Fund, and Tata Steel and Permasteelisa S.p.A. for the financial support and in kind support of this research.